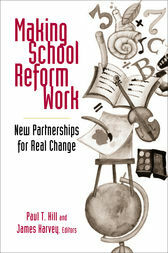 Paul T. Hill is coauthor (with Mary Beth Celio) of Fixing Urban Schools (Brookings, 1998) and (with Christing Campbell and James Harvey) of It Takes a City (Brookings, 2000). He is a nonresident senior fellow at the Brookings Institution and a research professor at the University of Washington's Daniel J. Evans School of Public Affairs. James Harvey is a senior fellow at the Center on Reinventing Public Education, Daniel J. Evans School of Public Affairs, University of Washington. He is also a Seattle-based consultant. A former appointee in the Carter administration, he helped develop the landmark report A Nation at Risk for the National Commission on Excellence in Education.